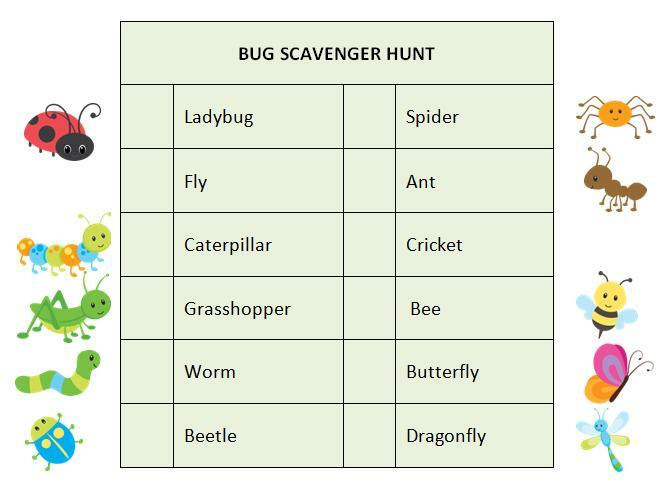 A bug scavenger hunt is a fun way to enjoy the afternoon while searching for creeping crawly critters. You can pack your children a little “bug finding kit” including a magnifying glass and binoculars. The children don’t actually have to catch any bugs in this game – they can just find them and point them out to you while not disturbing the little bug from his/her daily business. You could even bring along a camera for them to take pictures of the bugs to put them in a fun “Summer Activities” scrapbook – another activity for a rainy day. If at a park, you could also pack along a picnic lunch to enjoy with your little bug pals along with the free printable Park Scavenger Hunt. On our Recipes page you’ll find plenty of delicious ideas for picnic food and treats. You could end the game with a fun prize like a bucket of gummy insect candy and head inside to watch a fun insect movie like Bee Movie, Antz or A Bug’s Life. Have you seen any of these movies? Which one would you recommend? Do you have any bug phobias? Let us know in the comments below. For more fun & free printable games, visit our Printable Games page. We’re always adding new ideas for family fun, party ideas, moms’ night out ideas and more so join our communities on Facebook, Twitter, Pinterest or our new RSS feed Bloglovin’ for the latest updates. *Digital characters by Pixel Paper Prints.